Wily Peralta pitched five innings of three-hit, shutout ball to lead the Milwaukee Brewers to their first win of the season, a 6-1 victory over the Colorado Rockies on Wednesday night at Miller Park. Peralta walked one and struck out five hitters and left after five with a rising pitch count. Eric Thames led off the fourth inning with a home run to give the Brewers a 1-0 lead. Ryan Braun followed with an infield single and Travis Shaw added another round-tripper to put the Brewers up 3-0. Jonathan Villar also homered for the Brewers in the victory, but the turning point may have been the sixth inning. The Rockies had runners at 1st and 2nd with nobody out and Carlos Gonzalez hit a sharp grounder that looked like trouble, but Thames made a diving stop and got a force out at second base. Villar and Orlando Arcia combined to turn a double play to get the Brewers out of the jam. The Rockies scored their only run in the ninth inning with Mark Reynolds RBI single to left. Taylor Jungmann started the 9th inning but managed to get only two outs. Neftali Feliz came on to record a one out save, the 100th of his career. 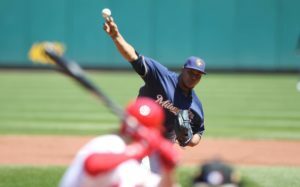 The Brewers will send Chase Anderson to the mound in the series finale this afternoon as the Brewers will attempt to gain a series split with the Rockies after dropping the first two games to start the season.